Well-rounded care for your heart. Learn more about how to use the Qiu to improve and maintain your health. Find out more about how to use BioSign’s HRV technology for your clients. From a professional HRV analysis with the HRV-Scanner (analysis of the vegetative nervous system, VNS analysis) via the self-measurement and biofeedback with the Qiu at home, up to the HRV monitoring over the myQiu Internet platform and comprehensive coaching tools. With us, you will find the perfect solution to realize your HRV concept. The HRV-Scanner is one of the most powerful HRV systems in the world with an unbeatable price / performance ratio. It combines the standard tests of the HRV analysis (VNS analysis) and the HRV biofeedback. In conjunction with the Qiu and the myQiu web platform, the HRV-Scanner enables effective HRV monitoring, e.g. for therapy control. 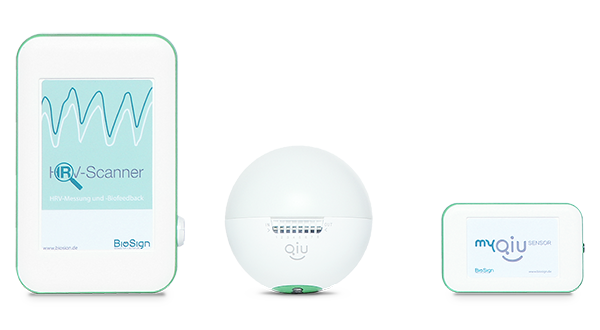 The Qiu is a milestone in HRV technology. Daily HRV biofeedback at home and on the road. The Qiu has an effect from the first training session. It aims directly at the health by strengthening the parasympathetic nervous system. For those who want to do something for themselves and want to see how their HRV improves. The myQiu Internet platform is an ideal supplement: PC biofeedback with the Qiu or the myQiu sensor. The measurements are stored in a cloud and are immediately available to your supervisor / coach. The intuitive online evaluation of your exercises will show you and your supervisor your progress. HRV monitoring in real time. Understanding complex relationships, interpret and communicate it easily. Learn more about how you can successfully use BioSign HRV technology. Competence in neurovegetative functional analysis for more than 15 years. 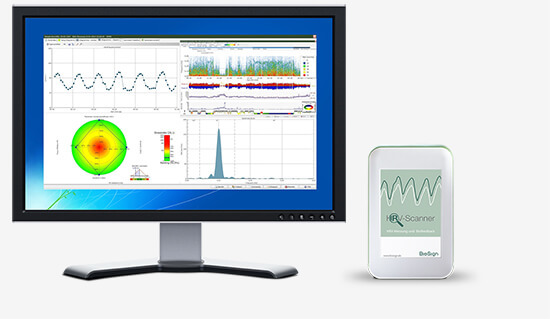 BioSign is one of the pioneers in the field of HRV measurement in Europe and has been developing measurement and therapy systems for professionals and users since many years.